Ancient Tamil recipes sans any modern ingredients. Each century with each invasion saw the addition of one or two spices. Spices like cinnamon,cloves and cardamom were incorporated with the traditional spices. Coconut and coconut milk was/is extensively used in Tamil cuisine and Thengai Paal Sadham could have been the result of a fusion between the two. Thengai Paal Sadham is a simple Tamil recipe where rice is cooked with all the flavors of coconut milk and seasoned with whole masala, Goes well with Pakoda Kuzhambu, Vegetable Kurma or any Non-Veg Gravy. I usually prepare Thengai Paal Sadham as a quick fix alternative to the Biriyani. In a heavy bottomed vessel ( preferably a non stick) or a pressure cooker, heat the oil and ghee and add the cinnamon, cloves, cardamom and bay leaves. When they pop, add the onions and saute until they turn golden brown. Now add the garlic and slit green chillies, saute well for another minute. Add salt and coconut milk , mix well and let come to a boil, add the rice and bring it to a boil again. Simmer for about 20 minutes. Garnish with fine cut Cilantro and roasted cashews. Serve with raitha and Vegetable Kurma or any Non-Veg Gravy. TIPS: Fresh coconut milk is used in this recipe, 4 tablespoon coconut milk powder mixed with 1/2 cup warm water can be used instead. I usually add 1: 1.5 cups when using Basmati rice ( 1 part rice & 1.5 parts water) , for Sona masuri rice add 1:2. Simple and aromatic rice. Love it with spicy kurma. YUmm, simply delicious,one of my favourite rice..
wow, simply love it. Tastes yummy with chicken curry.. I had been wanting to post coconut rice for a long time. My version is a little different. 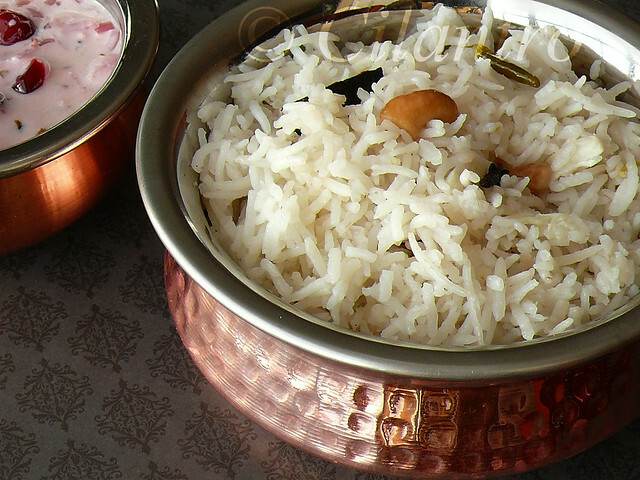 COconut rice tastes fab with spicy non veg curries, don't they? perfect looking rice. I prefer having with spicy chicken curry, looks delectable! yummm! love it with piping hot gravy ! They look perfect Cilantro. I have not had Thengai paal saatham. Got to try. Wow, that looks so well and tempting. Beautiful click. This is a very flavourful rice and looks very simple. I have had it at a friend`s place, but never got around trying it as the calories in coconut milk really make me think twice. Lovely clicks and the handi looks lovely! Rice looks so yummy and comforting..